Mueang Chiang Rai (Thai: เมืองเชียงราย, [mɯəŋ tɕʰiəŋ raːj]; Lanna: ᩮᨾᩥᩬᨦᨩ᩠ᨿᨦᩁᩣ᩠ᨿ: Mueang Chiang Hai; Lao: Mueang Xieng Hai) is a city in Mueang Chiang Rai District, Chiang Rai Province. Chiang Rai is the northernmost large city in Thailand. It was established as a capital city in the reign of King Mangrai, in 1262 CE. The city was founded by King Mangrai in 1262 and became the capital of the Mangrai Dynasty. Subsequently, Chiang Rai was conquered by Burma and remained under Burmese rule for several hundred years. It was not until 1786 that Chiang Rai became a Chiang Mai vassal. Siam (Thailand) annexed Chiang Mai in 1899, and Chiang Rai was proclaimed a province of Thailand in 1933. Chiang Rai lies on the flat alluvial plain of the Mae Kok River, a tributary of the Mekong, between the Daen Lao Range in the north and the Phi Pan Nam Range in the south. The Mae Kok River runs along Chiang Rai's north side, flowing eastwards out of Burma at Tha Ton(ท่าตอม) town, bending north-eastwards and joining the Mekong River about 40 kilometres (25 mi) north-east of the city. The Lao River, a tributary of the Kok, flows south of Chiang Rai. There are four bridges spanning the Mae Kok river within the town's boundaries, each running south–north. Most of the terrain surrounding Chiang Rai town is either flat or has moderate hills. The exception is outward in the west and north-west directions, where limestone hills are evident, some of which have straight-up exposed cliffs. That is also the direction where most of the region's Hill Tribe people have their villages, further afield. 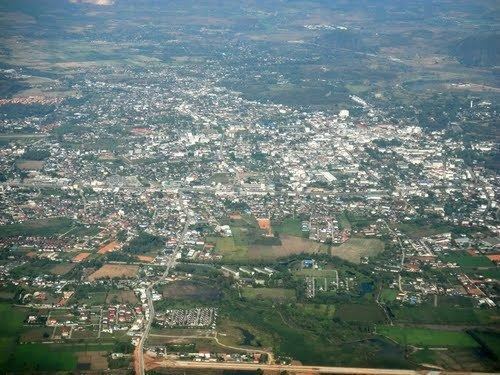 According to the Thailand National Statistical Office, as of September 2010, Chiang Rai municipal district had a population of 199,699. With the spread of the city extending into neighboring districts, the metropolitan area is considered somewhat larger by local residents. Chiang Rai city is the capital city and business center of the Chiang Rai Province, home to 1.1 million residents. 12.5% of the population belong to hill tribes, a collective term for the minority ethnic groups in north Thailand such as the Karen, Akha, Lisu, Meo, and Hmong. The city hall 19°54.805′N 99°49.615′E houses the provincial offices. The thesaban houses the municipal offices 19°54′34″N 99°49′39″E. Kasemrad Sriburin General Hospital Private hospital. Chiang Rai Prachanukhro Hospital Public hospital.